It's hot, all of our kids are drinking more than normal. So what do you do? 2) When you're out and about you do it as cheaply as possible by having chilled drinks from home with you. 3) If you don't want to have to battle obesity, you keep FIZZY drinks off the menu (I am so glad Aaron hasn't acquired a taste for them)! 4) Keep them away from ASPARTAME. If you are yet to jump on the bandwagon, do some research. 5) In my humble opinion Don't Shoot The Fruit and stay clear of Fruit Shoots unless it is their My-5 healthy option, which I wish more parents opted for, as then it would be THAT which would be at eye-level and not the other "rubbish". I think it is clear from several blog posts that I have penned over the years that I am very anti-aspartame, for a whole host of reasons. We were sent Vita Co Co to review and I am delighted to see it does not have the stuff in it, which means the PR got to know my blog and what I don't like prior to sending it to me. 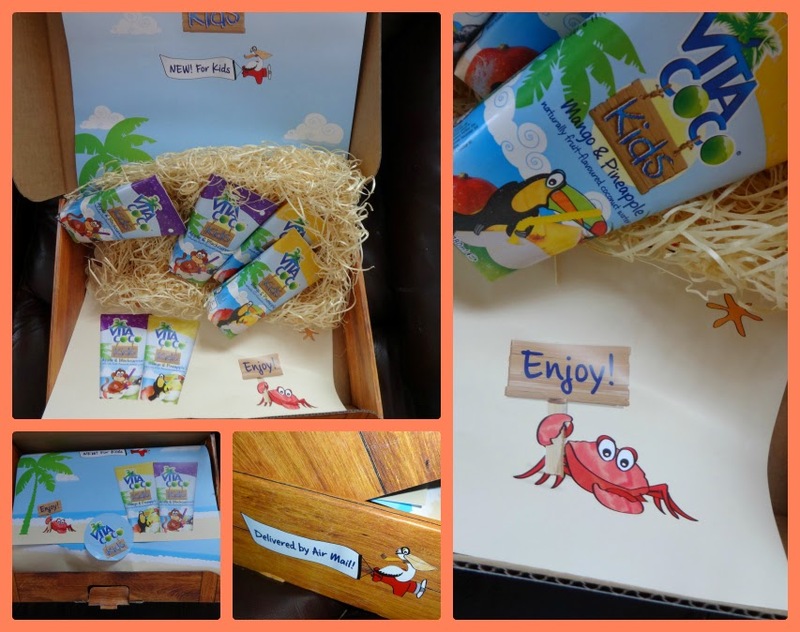 There's a BIG coconut water craze at the moment and I am great to see that thanks to this Kid's drink, kids can participate in the health benefits too. It doesn't taste good luke warm, so make sure you chill it. It's not a sweet as cordial, but Aaron liked it nonetheless (despite his Ribena addiction - full SUGAR no aspartame thank you). Currently, Vita Coco is available in two flavours: Apple & Blackcurrent and Mango & Pineapple. We liked the former but not at all the latter. 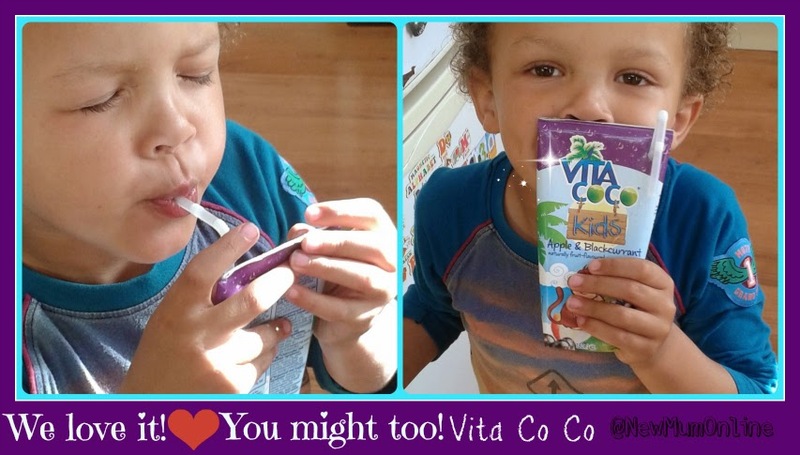 You can buy Vita Coco Kids at Waitrose, Sainsburys, Tesco, Ocaco, Amazon, Holland & Barrett, Whole Foods, Planet Organic, specialty and health stores and other independents. It's got less calories than other sweet kids' chilled drinks. It's got less sugar than other sweet kids' chilled drinks. It has a whole heap of POTASSIUM: 170mg per 180ml!!! Potassium is essential for your body's growth. It helps maintain the normal function of the heart, kidneys, muscles, nervous system and fluid balance. A diet high in potassium can reduce the risk of high blood pressure, which is one of the risk factors for strokes, heart attacks and chronic kidney disease. What blew me away the most was the packaging. When I was working, we always ensured that product included a letter and/or a compliment slip, but I find as a blogger, receiving product, this does not happen. Vita Co Co for Kids sure turned this around. The product was the hero in THIS delivery, hence another reason for my glowing post. The cartons of drink were in a box, with "hay" and the box was beautifully branded, and within the box there was a sleeve, which was another excuse for more branding. Disclosure: I was sent the product for an honest review and was not at all told what to say. I haven't even got time to be writing this post, but so thrilled was I with the product (in one flavour) and the packaging, here I am! I love coconut water, so so so healthy. I am glad that they have found a way to brand it for children! 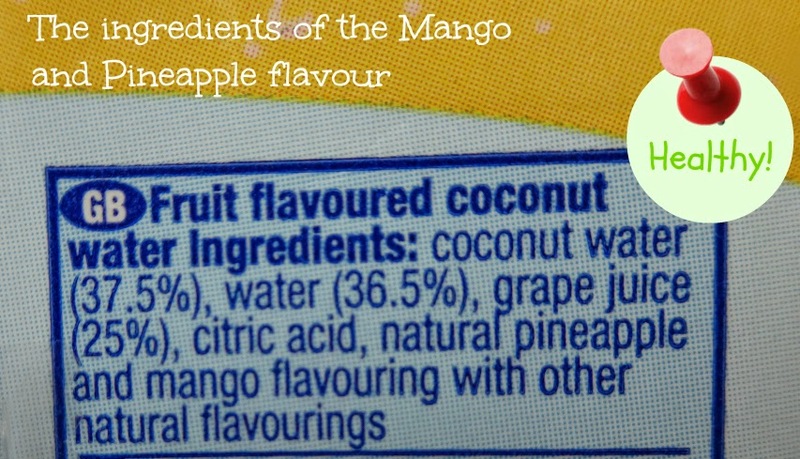 We reviewed this too, and we were the opposite that we preferred the mango & pineapple one. I also agreed about the box sample. Great branding - so nice to know who's sending you the item! Sounds like a great drink. I will have to look out for it next time, thank you.